Methinks that Mr Osborne’s main talented occupation is dishing out flannel instead of managing public finance. Of course he’s an MP one of the main talents required to sit on the front benches. It was a play on words – “towel folder” – “flannel”. Not only is he embarrassed but he’s an embarrassment to the UK, which has been shown so many times we’ve lost count. Mike here shows the ex-department store towel-folder’s misstatement about the total amount of tax they had managed to claw back from evaders, along with the way his neoliberal policies are wrecking the NHS and public services. To paraphrase the Hitchhiker’s Guide to the Galaxy, here is one unhoopy frood who really doesn’t know where his towel is. 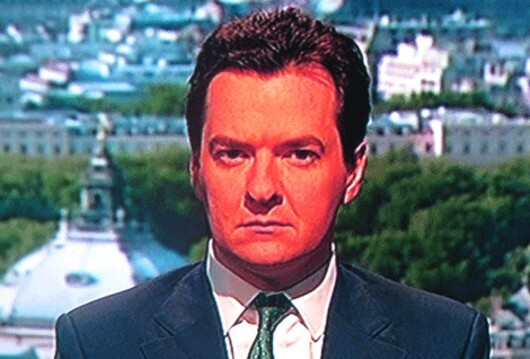 Georgey Porgey only had to be born to be worth £ miliions……thanks to Daddy Osborne’s TAX AVOIDANCE HABITS! Osborne married The Hon Frances Victoria Howell (b. 18 February 1969), author and elder daughter of the Conservative politician and Government Minister Lord Howell of Guildford, on 4 April 1998. The couple have two children, Luke Benedict, born at Westminster on 15 June 2001, and Liberty Kate, born at Westminster, London, on 27 June 2003. He has an estimated personal fortune of around £4 million, as the beneficiary of a trust fund that owns a 15 per cent stake in Osborne & Little, the wallpaper-and-fabrics company co-founded by his father, Sir Peter Osborne, Bt. Osborne was educated at independent schools: Norland Place School, Colet Court and St Paul’s School. Unfortunately, he lost his job folding towels because he lacks adequate qualifications. He achieved a 2:1 in modern history !!!!!!!!!!!!!!! and put in charge of the government finances, it’s an absolute joke but not so funny for those receiving the thin end of the wedge. It is like putting Frank Bruno in charge of he NHS. God pour me a whiskey, the more I read about this shower the more depressed I become. I have taken to having long walks with the jack russell to try and clear my head. Something which really annoys me to the core, how can this shower have the audacity to stand up in Westminster and address each other ” The right honourable gentleman” when they are ripping the country apart and lining their own pockets?? The adjective of “Honourable” meaning worshipful, I would not wish to breath the same air as them, hence why I live in the mountains in North Wales, the further away the better.